Def: A predominantly white lesion of the oral mucosa that cannot be characterized as any other definable lesion. 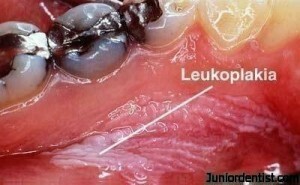 Examples White lesions : candidal leukoplakia, Hairy leukoplakia, tobacco induced lesion, Idiopathic leukoplakia. Age/gender: Above 30 yrs of age, occurs more in males. Candida albicans – candidial leukoplakia shows more chances of malignant transformation. 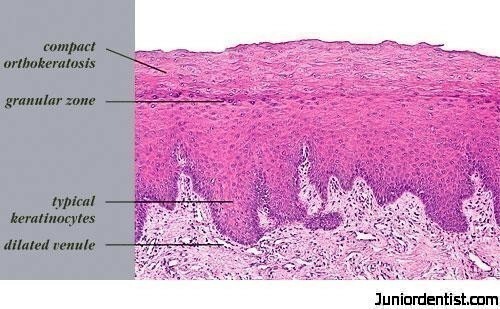 Non Homogenous: Part of the lesion is white and the rest appears reddened, well demarcated white areas, interspread with reddened areas. Associated with mild complaints of Localized pain or discomfort. It can also be called Erythro leukoplakia or Speckled Leukoplakia, and Verrucous Leukoplakia also comes under this. Histopathological Features: Presence or absence of Epithelial Dysplasia. Epithelial Hyperplasia, Surface hyperkeratosis. For homogenous – to knw the extent of dysplastic changes.